None of the early historical writers of the Order fail to mention Blessed Mannes. His stock was not the least noble among the grandees of Catholic Spain. His parents were Felix Guzman and Jane of Aza, in whose veins also ran some of the best blood of Old Castile. On both sides Mannes could count brave defenders of his country. But what was of infinitely greater importance to him were the holy lives of his own immediate family. His father was a splendid type of the Christian gentleman. His mother has been raised to the honors of the altar under the name of Blessed Jane. His eldest brother, Anthony, became a model priest, who devoted his life to the care of souls, the welfare of the poor, and the aid of the sick, and died with a great reputation for sanctity. Dominic, the youngest and perhaps the only other child, became the founder of the Friars Preacher. He is canonized. Surely this is a record of which any one might well be proud. Blessed Mannes first saw the light of day in the ancestral castle, Caleruega, Old Castile. The date of his birth can only be estimated from that of Saint Dominic (1170), than whom, we are told, he was a number of years older. Like Anthony, he chose the ecclesiastical state at an early age. Of his ordination to the priesthood and where he made his studies we know nothing. However, Spain was most likely the theater of both. The earlier writers of the Order, while reticent about these things, all tell us that he was of a retiring disposition, and much given to prayer and contemplation. Yet an apostolic zeal evidently burned in his breast. Almost immediately after the return to Spain of the Right Rev. Didacus (or Diego) de Azebes (often called de Azevedo), bishop of Osma, whom Saint Dominic had accompanied to Rome, Mannes set out for France. From the bishop he learned the need of missionaries in Languedoc, where Dominic had been left to combat the errors of the Albigenses. Possibly de Azebes, for he was a saintly prelate, suggested that Mannes should also take up this work. At any rate, we find him with his younger brother before the close of 1207. From this time the two men, for they were cast in the same spiritual mold, toiled hand in hand for nearly ten years that they might free the Church of southern France from the poison and turmoil of heresy, and restore it to its former peace and beauty. Not once in all this time did Mannes take a vacation, or pay a visit to his native land, which he loved none the less because he had dedicated himself to the service of God. He felt that his place was where religion needed his attention so sadly. His zeal was tireless; his efforts unceasing. Perhaps on no other did Dominic depend so much. Doubtless, if the full truth were known, history would have to associate Mannes more closely with the saint’s success, as well as give him more credit for the part he played in the conversion of the Albigenses. No danger or hardship could cause him to falter in his labors. He was a splendid preacher. Like Dominic, he intermingled prayer with his sermons and instructions. By his shining virtues and mortified life he wielded a stronger influence for good, whether among the faithful or those who had wandered from the path of truth, than by his eloquence. One of Blessed Mannes’ most striking traits seems to have been his humility. He knew not the meaning of the word pride or jealousy. The one thing he sought was the glory of God and the salvation of souls. Although older in years, he obeyed his brother as a dutiful son does the will of his father. When Saint Dominic established his Order, Mannes was among the first to place himself under his standard, and to receive the habit. Thus we find him among the “sixteen” zealous men whom God selected as the foundation stones on which to build the Order of Friars Preacher. One would be perfectly safe in the assertion that, when (August 15, 1217) the chosen little band took their religious vows on bended knees before the patriarch, not one of them entered into the ceremony with a better heart, or in more of a spirit of self-sacrifice, than Blessed Mannes. This event took place in the conventual church of the Dominican Sisters, Prouille, southern France. The annals of Prouille are very explicit in the matter. From their statement and that of Father John of Navarre about the time of his entrance into the Order, which he made in his testimony to the holy life of Dominic to the papal commission appointed to examine the saint’s cause for canonization, it would seem that the sixteen brethren had taken their vows at Saint Romanus’, Toulouse, after Innocent III sanctioned the foundation of the Order. However, after its confirmation by Honorius III, Dominic had them renew their profession. Such was his love for Prouille, around which so much of his work centered, that he chose this place for the ceremony, and as the point of their departure for the various countries to which he sent them. Blessed Mannes was chosen as one of those who were to start a house of the new Order in Paris. He had six companions — Matthew of France, who was the superior; Bertrand of Garrigue, so called from the place of his birth, a little town in southern France; Lawrence of England; the two Spaniards, John of Navarre and Michael de Fabra; and Oderic of Normandy. The last mentioned has the distinction of being the Order’s first lay brother. They travelled in two parties. That composed of Mannes, Michael, and Oderic reached their destination first, September 12, 1217, being the day of their arrival in the great French capital. For a while the fathers were obliged to live in a house near Notre Dame Hospital, in the center of the city. But their zeal, eloquence, and model lives soon won them many friends. Among these was John de Barastre, a celebrated master of the University of Paris, dean of Saint Quentin, and a royal chaplain. The noted ecclesiastic had established a hospice for strangers near the gate of the city called “Porte d’Orleans.” The hospice bore the name of Saint James. This he now conferred on the homeless Friars Preacher, and they took possession of it August 6, 1218. It became the famed Saint James’ Convent and Studium, than which none is more celebrated in the Order. Thus Blessed Marines was one of the founders of this well-known institution, which played a conspicuous part in the history of the University of Paris. His sermons are said to have borne rich fruit in the French capital, for he had a splendid gift of oratory. Besides, he was endowed with an extraordinary personal magnetism; while his kindly, open, and friendly disposition exercised a strong influence over souls. Few could resist his appeals for a better life. Just when the subject of this sketch left Paris, where he was much beloved, the writers do not tell us. 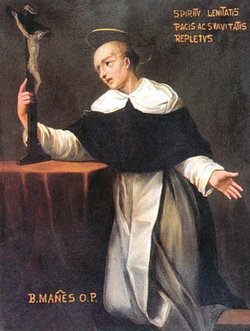 But it is known that Saint Dominic himself sent him from there to Madrid, Spain; and from this we can form a most reasonable conjecture as to the time when Mannes returned to his native land, which he does not appear to have seen since 1207. While in Spain in connection with affairs of his Order, Dominic found Peter of Madrid organizing some pious ladies for a religious community in that city. The saint gave them the habit, admitted them to their vows, and started the construction of a convent for them. This was early in 1219. From Spain he made his way to Paris. While in this city, which he reached before the middle of the same year, he evidently appointed Blessed Mannes to take charge of the sisters in Madrid, and sent him to the Spanish capital; for we find him there shortly afterwards. Several things, no doubt, conspired to bring about the choice of Mannes for this position. He was growing old, and long years of hard missionary labor must have begun to tell upon his strength. He was a most spiritual, devout, and prudent man, which recommended him for such a charge. His disposition led him to prefer a quiet, retired life, in which he could give himself more to prayer and contemplation, to one of activity among the people. Besides, his practical turn of mind rendered him a suitable person to superintend the temporal affairs of the sisters, whose cloistered state made this difficult for themselves. The holy man called their convent Saint Dominic of Silos, which he doubtless did because his own brother was named after the Cistercian abbot. From Madrid Blessed Mannes attended the second general chapter of the Order, which was held at Bologna in 1221. Through him, on his return, Saint Dominic sent a letter to the youthful community of Spanish sisters, which is of no little interest because it is the only authentic writing of the saint which has survived the ravages of time. In it he tells them, briefly, of the joy it gave him to hear, through his brother Mannes, of their piety and of the completion of their convent. Both the one and the other are largely due to Mannes’ exertions. He is, therefore, constituted their ecclesiastical superior, with almost plenary powers. Very probably the holy man held this position the rest of his days, for we find no record of him elsewhere. With this work, we doubt not, he combined no little preaching in and around Madrid. At times perhaps his confrères took his place at the sisters’ convent, while he labored in more distant localities. His life as a religious is said ever to have been edifying to his brethren and useful to his fellow man. Some place his death in 1230. Others say that he died about this time (“circiter 1230″). But the Année Dominicaine informs us that Roderic “de Cerrate,” a Spanish Dominican of the thirteenth century, states (in his Vitae Sanctorum) that, after Saint Dominic’s canonization, Mannes went to Caleruega and persuaded the people to erect a church in honor of his brother; that he told them a modest edifice would do for the time being, for Dominic would see that a larger one should be built later; and that this prophecy was fulfilled some thirty years later. This would make the holy Friar Preacher die, at the earliest, in 1234 or 1235. It would also explain how he came to be buried in the Church of Saint Peter attached to the Cistercian monastery near Gumiel de Izan. The monastery is not far from the birthplace of Dominic and Mannes, whose ancestors were laid to rest in its temple of prayer. Most probably, therefore, Mannes became sick while engaged in this work of piety, died with the Cistercians, and was buried in their church, for the simple reason that his own Order had no house in that part of Spain. During life the missionary bad been considered a saintly man and a perfect imitator of the virtues of his brother, Saint Dominic. Not long after his death, miracles began to be wrought at his tomb in such numbers that it became a place of pilgrimage. Because of this his relics were transferred to a more honorable place. Strange to say, Father Chrysostom Henriquez, a Cistercian writer, (in his Menologium Cistersiense) represents the Friar Preacher as a Cistercian. However, this author has been criticized more than once for inaccuracies and carelessness. Not only did Dominican writers correct him in this instance; for Mamachi, who says that Henriquez could not have read the epitaph on Blessed Mannes’ tomb, informs us that another Cistercian author, Father Angelus Manrique, states most positively (in his Annales Cistercienses) that he was a Dominican and a brother of Saint Dominic Guzman. Reports of the cures obtained through intercession to the man of God soon became widespread. Devotion towards him grew particularly pronounced throughout Spain. In the Diocese of Osma, and especially around Caleruega, he was considered one of the popular saints. More than once petitions for at least his beatification were forwarded to Rome. Although these were not acted upon, the veneration in which Mannes was held rather waxed stronger than decreased with the course of time. For this reason, some six hundred years after his death, the former Camaldolese monk, Mauro Cappellari, who ascended the throne of Peter in 1831 under the name of Gregory XV1, beatified him, and granted his office and mass to the Order of Preachers. July 30 was set apart as his feast day. Beatified: cultus approved by Pope Gregory XVI in 1834.